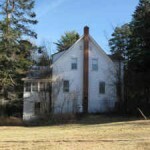 The real estate market in general was in the dumps – and in particular, people were not eager to purchase antique farmhouses in central New Hampshire – so the house stayed vacant for a year and a half. Meanwhile, I was toying with the idea of taking a sabbatical from my career working for a large multi-national corporation to focus on my interests of creative writing, blogging, and working on my artwork (assemblages). While exploring my options, I kept being drawn to the foothills of New Hampshire’s White Mountains – an area I have loved all of my life. Once I made the decision to put the career on hold and shared it with my family, we discussed the possibility of taking the New Hampshire estate off the market and having me spend my sabbatical there. The thought of this was romantic, and it solved a few challenges for all of us, and so, I sit there now, and I am well into the journey. Exactly how it all came to be – and all the experiences – scary and joyous – I have encountered so far, will be fodder for the Lost Cowboy Found blog as I progress. So there you go – you are all caught up. Again, if you come along for the ride, you will get a better understanding of what my sensibility is, and what the idea behind Lost Cowboy is all about. Lost Cowboy is powered by	WordPress 5.0.4 and delivered to you in 0.740 seconds using 40 queries.